January 1, 404 is the date of the last known gladiatorial combat in Rome, and therefore also the traditional martyrdom date of St. Telemachus — who gave his life to end the games. Rome’s infamous bloodsport dated to the foggy natal days of the Republic, perhaps beginning as funerary rituals borrowed from the Etruscans or Campanians. Its efflorescence into ubiquitous public entertainment diversified for special occasions by stupefyingly wasteful grotesques like naval battles in a flooded stadium or exotic animal fights marks — moralistically if not materially — the empire’s decadence and decline. Fitting indeed that Rome’s most impressive lower-class rebellion originated with a gladiator, Spartacus. The spectacle was as popular as it was dangerous. For trainers and recruiters, it was also enormously lucrative, yet it was simultaneously distasteful in its own time and gladiators (for their brief lives) were a stigmatized caste. 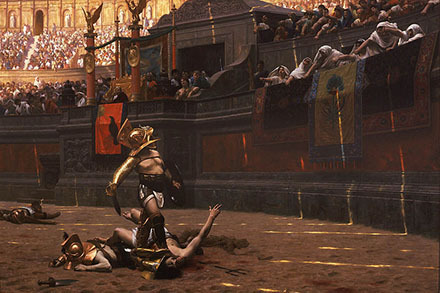 Gladiatorial games’ long-term decline might have set in motion because they were so godawful expensive and a Rome gradually less vast and omnipotent just didn’t have the resources to burn on a new Super Bowl every time some frontier general marched into town to proclaim himself emperor for the next six months. But Christians especially lodged early and vociferous critiques of the games and curtailing — and finally eliminating — gladiatorial combat is a signal contribution to humanity by the early faith. Tertullian composed a letter, On Spectacles, dedicated to proving to Christians with a weakness for low pleasures that men slaying one another for sport are idolatry and murder. Christianity’s growing strength in the empire would eventually position it to put a stop to the evil show. The upstart faith’s first regnant champion, Constantine, laid down the first imperial ban on gladiator fights (“Those who were condemned to become gladiators for their crimes are to work from now on in the mines. Thus they pay for their crimes without having to pour their blood.”). As was his wont, Constantine was less than constant about following his own directive, intermittent directives by emperors over the decades to come testify to the ancient sport’s deep-rooted popularity but also to the steady pressure that ascendant Christianity continued to apply against it. Its fade was gradual, but the closest thing we have to a specific end point is January 1, 404, games sponsored by the teenage Western Roman emperor Honorius to celebrate Stilicho‘s parrying the latest Gothic thrust. Into this carnage, it is said, strode a Greek monk, Telemachus who publicly objected to the unfolding spectacle. For his trouble he was killed by mob action or official order. The story of what exactly happened has evolved over time but its upshot was that Honorius proceeded to ban the ungodly exhibition. It never again resumed (at least in the West), leaving the field clear in future centuries for Rome’s other degenerate sport, charioteering.